48 pages, $15.00 paperback, culturalsociety.org. 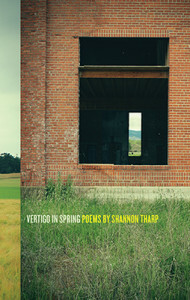 Shannon Tharp’s second book, Vertigo in Spring, does nothing less than boil down the sense of becoming’s ordinary bruises—alienation from one’s chosen place to live, failed love, distant or lost loved ones, vocational aimlessness—to a fundamental condition of spiritual bereavement. Like a bluegrass record that’s been turned into a crisply lined mural then translated into a book of poetry, Vertigo in Spring traverses this space using language that is compact and discomposing in its barefacedness. On its surface, Vertigo might seem to sound a plain, profound wail venting the pain of homesickness. A trail of narrative details reveals that the poems’ speaker left Wyoming for wet, wet Washington, where she feels disconnected and uneasy. The Pacific Northwest landscape and the cityscape stand against something essential to her makeup: “I want to be where the ocean / isn’t possible, where the only other / animal around is a totaled carcass” (“Archival” 7). Washington’s weather floods the mind as an unremitting, oppressive mood: “rain, rain, // rain making clear its hurtful weight, reminding / us of the truth whenever we move through it” (“Family Planning” 30). With a flip brusqueness that betrays her seriousness, the book’s voice avows her eyes’ devotion to what she’s left, apparent now in hindsight: “My love’s / no / kind of / blind love— // I have only / eyes for / you” (“Rearview Mirror” 11). I read these lines literally: her eyes are conditioned, from years of looking, to find love and beauty in the shapes of Wyoming, just as eyes are conditioned to perceive vertical and horizontal lines. The book’s persona feels, too, the pangs of being distanced from her people back home. Her unsentimental tone belies her devastation when she notes her isolation on a day with family significance, writing, “On what would’ve / been my grandfather’s / eightieth birthday, // I’m in Washington / beside nobody” (“Preservation” 9). And as in “Rearview Mirror,” many of the book’s terse, bluesy verses speak directly and desirously to a “you” that could just as well be a faraway lover as the state she’s quit. These first lines reframe what might appear to be nostalgia as a more pervasive kind of homelessness. Often the voice expresses a yearning for her place of origin in the same breath as naming it harrowing, nullifying, lifeless. “Postcard to My Sister” interfuses the “open sky over / Wyoming” where the “hills plateau” with terror and intense loneliness (8). “Preservation” includes the concession that Wyoming was the geography from which the speaker “wanted relief” (9). Even as she struggles to live in the Northwest, the speaker sees Wyo as deathly: “When I think in the city, I think of how / I haven’t yet died on the side of the road. // It would take leaving the city for this death / to take place, as no one should be there to see” (“Sublimation” 3). More, she associates her past home with a near-death experience: again in “June,” “it’s / like you said— / would’ve / turned / up // dead / in a car” (10), and almost at the book’s midpoint in “Returning to Glass,” “I’ve said nothing of the death I’d been warned / of, or how close it was. It could’ve been” (16). In the distance the book travels, the speaker’s figurative deaths and possible actual death commix with Wyoming’s dying prairielands. Recalling the line quoted earlier from “Archival,” the speaker insinuates a link between her former home and an image of a “totaled carcass.” A persistent, muted strain implies the creeping obliterative forces of urban extension. “These Days” describes patterns that “wave, wave / from the distance / they’ve consumed,” calling to mind an abstraction of a gridded, consumptive city as seen from the country; the poem also imagines the rural as “perfect with circles,” suggesting an imposed finitude. it breaching a carousel in New York. side taken, there’d be unexpected sun. The speaker’s move destabilizes her concept of “home,” leaving her dispersed, vertiginous. In the absence of “home,” the speaker suffers from purposelessness, speechlessness, musiclessness: “It’s just that I’ve / been useless—even // music wanted to lose / me” (1). Tharp gets to the severity of her voice’s despondency in “On the Beach” with the confession, “Earlier, sun / on my neck, I said / ‘I will never be a scholar.’ // What I meant was / I feel meant for / nothing” (13). Yet, she counters hopelessness with an almost Protestant ethic: “If nothing else, this flat love puts me to work / to show me that I don’t know where I’m going” (7). “Work Poem” teaches us what job the book will do to allay its speaker’s spiritual deficit. It will try to sculpt a language (contemplated inwardly or spoken) that opens onto loss’s “hurt, love’s form affirmed, / in a way that approaches truth” (6). Through allusion and dedication, Tharp names Helm, Joseph Ceravolo, Ric Caddel, Anna Kamienska, and Margaret Kilgallen as the quintumvirate from which she takes inspiration for her open form. In “Chain of Waves,” a poem written for Ceravolo, Tharp apostrophizes her dedicatee as if to invoke a muse, imploring him, almost desperately, to show her how to love the ocean, the city’s sea of faces: “There’s nothing / to love in this collected something, some / tide come up to say hi and lapse into // the ocean the same as before. What face / do you want me to take when I decide / to go swimming? And how should I begin?” The poems in Vertigo share Helm’s country-song straightforwardness and broadness; Ceravolo’s declarative intensity and his ability to conflate the mystical with basic human experience; Caddel’s subtle pained humor, his vulnerability, and his talent for getting so much into a thumbnail sketch of a lyric narrative; and Kamienska’s humility, severity, meditative solitude, and steady contemplation of darkness and mortality. Mission School artist Kilgallen is most ascendant in her pantheon, however. “Work Poem” and “Close-up (with Margaret Kilgallen)” understand Kilgallen’s lifework as an ideal form, almost saintly in its proportions. Many of the poems in the book behave like Margaret Kilgallen’s hand lettering–inspired paintings—the words feel graphic, freehand, three-dimensional, boldfaced. All of them preserve the clumsiness of writing feeling as a way to honor the “wavering line” that Kilgallen loved: “I’m not supposed to tell you I miss you— / this much is true. It’s a sort of progress // in that I can no longer speak devoid / of sentiment, but have grown to temper // feeling and its given difficulty” (“Returning to Glass” 17). The two pantoums in the collection formally perform Kilgallen’s process; Kilgallen would go over and over a line to try to make it straight, but finally find beauty in the line’s imperfectability, in the way its imperfection left a trace of the human hand. The book’s themes of wandering and homelessness also connect to Kilgallen’s interest in hobo tags, a form of expression that could be said to both create and represent a kind of oikos in transience. Tharp shares in common with all her guiding genii the courage to take on separateness and love and the anxiety of making life purposeful without the smoke screens of implication and obscurity. Happily, the final pages of the book leave the bright impression that, in slowly chiseling out an open and opening form of expression, the speaker has made a home. “After Grackles,” dedicated to Caddel, begins, “Home, home. // The choosing / to live where / form becomes / clear” (35). Another enters into the new space, the room, this form holds. The “you” no longer reads as the place left behind, but as a romantic other who has arrived.